This Safavieh Courtyard area rug is sure to make a statement in any room of your modern home. Decor does not have to be hard with this plush synthetic indoor/outdoor rug. Make a lasting style statement with this machine-made rug. Add this floral plants patterned beige tan rug to the dicor of your home for a contemporary infusion. Inspired by traditional natural earth tones, the 6'6"x8'8" Monaco Paxon Brown indoor/outdoor mat features a calm and serene foliage pattern using a blend of brown yarns which sports a natural and comforting look that will complement any living space. This premium rug is made with high quality PVC fibbers, resulting in a mould, mildew, and stain resistant flooring solution for your home. Densely woven with textilene fabric, this mat provides unmatched durability and longevity while making it effortless to clean: simply spray with a hose or wipe with a damp cloth. Crafted and made in China. Courtyard Marc Natural / Brown 5 ft. 3 inch x 7 ft. 7 inch Indoor/Outdoor Area Rug This Safavieh Courtyard area rug is sure to make a statement in any room of your modern home. Decor does not have to be hard with this plush synthetic indoor/outdoor rug. Make a lasting style statement with this machine-made rug. 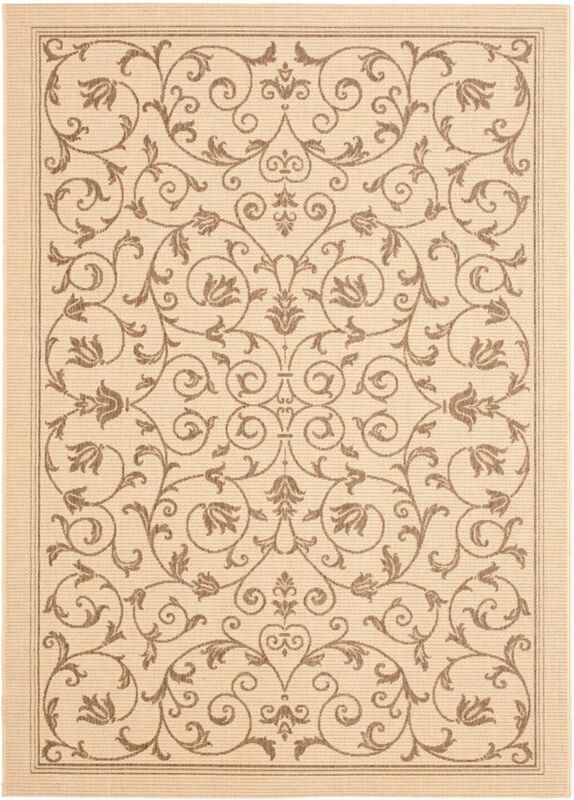 Add this floral plants patterned beige tan rug to the dicor of your home for a contemporary infusion.